Markets reprice risk as trade and interest rate risks emerge. The Dow Jones Industrial Average lost more than 1,400 points last week, against a backdrop of trade actions and reprisals. Buying appears to be on hold, at least for now, following a year or more of solid gains for stocks. It is always hard to pinpoint which, the chicken or the egg, comes first when talking about markets and the economy. To our eye, the two work in conjunction and feed back into each other. We all recognize that an improving economy tends to promote higher stock values. Rising stock values also feed confidence and spending, and makes capital cheaper and more abundant. An interruption in confidence, whether warranted or not, can interrupt an otherwise virtuous cycle. Each day requires us to assess the conditions that lie before us. 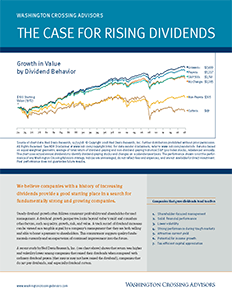 Market behavior, trends in economic data, and valuations all matter. Changes in these factors shape and reshape the forecasts that drive tactical decisions by asset class. In the last quarter, we’ve seen several changes worth discussing. The Federal Reserve (FED) raised short-term rates by 0.25% and continues to point toward more to come. We are assuming two more rate hikes this year, which would lead to an end of negative real interest rates and ultra-easy money in the United States. Inflation expectations have picked up a bit. The 2.1% long-run inflation expectation priced into the bond markets is now over the Fed’s 2% target. An unanticipated and sustained rise in inflation increases the risk that the Fed over-tightens monetary policy, choking off the expansion. The stock market’s price-earnings ratio eased back down to 17.1x from 17.9x, based on expected earnings. A surge in forecast earnings, partly due to tax cuts, brings the forward S&P 500 expected earnings figure to $160. The near-term U.S. growth rate became a little soft. For example, both Macroeconomic Advisers and the Atlanta Fed now forecast first quarter GDP growth of 1.8%. The expectations were in the 3-4% range when the year began. None of this signals the immediate end of the expansion or bull market. In fact, the reassertion of some rational pricing into markets could go a long way to sustaining the expansion. We are also watching the dollar, which contrary to our call this year, remains under pressure. The faster anticipated growth tied to last year’s tax cuts has not translated into dollar strength. So far, the focus on rising fiscal deficits and talk of trade wars have done little to help the greenback. The weaker dollar, in turn, is helping to lift some commodities and economies tied to such commodities. Beyond these recent market disturbances, little else appears awry with the growth outlook. Corporate profits, capital spending, and global growth all seem to be doing fairly well. Last week’s strong capital goods orders report, for example, points to continued acceleration of business investment and a second half pickup in growth. For now, we continue to monitor the interplay between financial markets and the real economy. While levels of economic activity are good, there appears to be little room for growth to disappoint, given market valuations. Risk of a disruption to trade, or excessive monetary tightening, are both risk factors that markets need to factor in. 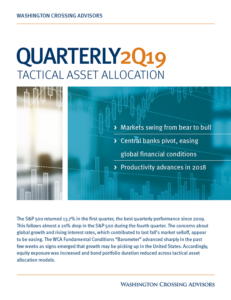 Next week, we will be releasing our second quarter Viewpoint and updating tactical tilts in the core portions of tactically managed portfolios. The Standard & Poor’s 500 Index is a capitalization-weighted index that is generally considered representative of the U.S. large capitalization market. The securities discussed in this material were selected due to recent changes in the strategies. This selection criteria is not based on any measurement of performance of the underlying security.